Also the third movie for A Lakshmikantan, with whom I have previously worked with in Unnale Unnale and Dhaam Dhoom. He has been one of the closest people to work with the late Jeeva sir. I would have to reiterate - Most of what I have learnt about dubbing have been from him. One of the most straight-forward, honest, simple individuals that I have met. The dubbing sessions have been the funniest I as I have said before because of his sarcasm and extraordinary sense of timing. Someday I shall interview the people, on video who work in the dubbing studios and play it here. You should know the amount of shaping that these people do. This is where I learnt that a movie could be lifted several rungs higher or brought down several rungs just in the way the sound is scaped. To extract the right thing from the artistes at the studio, as I have seen is also done by the sound engineers. I have marveled and continue to do so at their work, talent and sheer expertise. No doubt the sessions of this movie were a lot of fun, at the Trinity Studios, Alwarpet. This is where I worked in Unnale Unnale, Dhaam Dhoom, Satham Podadhey, TN07 and another upcoming movie. Ever since I started dubbing, I have probably refused scores of opportunities, asking the people who called me whether it was necessary for Chinmayi to be doing this. I would ask them to ask themselves and if they are satisfied with the answer, they could call me, either which way Mom and I would dissuade them. There are so many people for whom dubbing is bread and butter. I am doing it because it provides a different creative experience. And I have learnt and continue to learn a lot. Starting from Sillunu Oru Kadhal to the latest release Vaaranam Ayiram, I am glad opportunities have been given to me to explore. Please wish well for this movie for the hopes, dreams, efforts and the future of many are dependent on this one. i read varanam ayirm sameera was speaking in your voice.When i was watching the movie each time when sameera speaks some how ur face comes to mind as if youy are saying somethong in super singer. 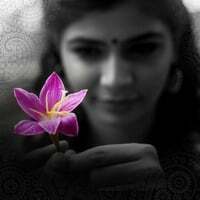 but 4 us, super singer means chinmayi n chinmayi means super singer. yugi n malini may b too good in their own subjects. but 4 super singer v cannot imagine them in your place. if u r not going to anchor d show what will b d result? n it is d producer's headache 2 worry abt d ratings.